Vancouver, British Columbia, Canada. April 21st, 2010. Columbus Gold Corporation (CGT: TSX-V) ("Columbus Gold" or the "Company") is pleased to announce that drilling has commenced on the Company's Summit Project where joint venture partner Agnico-Eagle Mines Limited (AEM: TSE & NYSE) is earning an initial 51% interest by undertaking staged annual exploration expenditures and making annual cash payments to Columbus Gold. 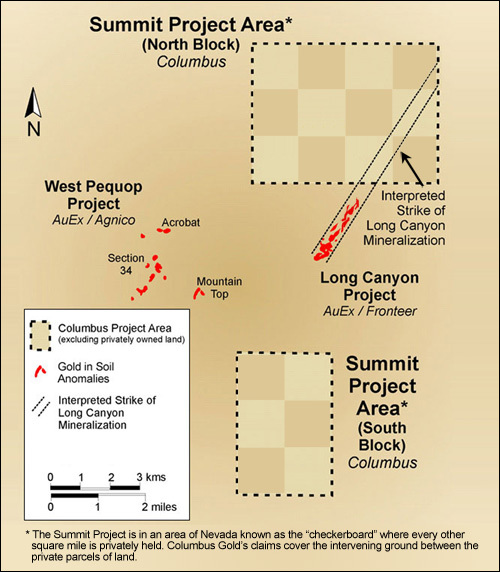 As reported by AuEx Ventures, the Long Canyon gold deposit consists of multiple, sub-parallel north to northeast-directed zones of oxidized Carlin-style gold mineralization, amenable to open pit mining, aggregating 1,300 ft (400 m) in width with a current strike length of approximately 1.60 miles (2.6 km) that is still open to extension. Mineralization outcrops in the central portion of the deposit and plunges shallowly to the northeast towards Columbus Gold's Summit Property. Drilling at Long Canyon is now estimated by Columbus to extend to within 3,280 ft (1,000 m) outside of Columbus Gold's Summit Property boundary. In March 2009, AuEx Ventures reported an indicated resource of 363,000 ounces gold from 4,808,000 tonnes averaging 2.35 g/t and an inferred resource of 459,000 ounces gold from 8,780,000 tonnes averaging 1.63 g/t, and reported the completion of a positive initial Preliminary Economic Assessment. The reported resource and assessment didn't include the results from more than 200 holes that were drilled in 2009. AuEx has reported that about $20 million in expenditures is planned at Long Canyon in 2010. Andy Wallace is a Certified Professional Geologist (CPG) with the American Institute of Professional Geologists and is the Qualified Person under NI 43-101 who has reviewed and approved the technical content of this news release. Mr. Wallace is a VP of Columbus Gold's U.S. subsidiary and the principal of Cordilleran Exploration Company ("Cordex"), which is conducting exploration and project generation activities for Columbus Gold. Columbus Gold's and Columbus Silver's project activities are managed on an exclusive basis by Cordilleran Exploration Company (Cordex), which has a long and successful history of gold discovery and mine development in the United States. Columbus Gold maintains active generative (prospecting) and evaluation programs and, as a key element of strategy, broadens exposure, minimizes risk and maintains focus on high priority prospects while seeking industry finance through joint ventures on selected projects. The Company currently has 8 of its projects joint ventured to major and junior mining companies. This release contains forward-looking information and statements, as defined by law including without limitation Canadian securities laws and the "safe harbor" provisions of the US Private Securities Litigation Reform Act of 1995 ("forward-looking statements"), respecting the Company's exploration plans, and Agnico-Eagle Mines Limited's ability to earn into the Summit Project. Forward-looking statements involve risks, uncertainties and other factors that may cause actual results to be materially different from those expressed or implied by the forward-looking statements, including without limitation the ability to acquire necessary permits and other authorizations; environmental compliance; decisions made by Agnico-Eagle that are outside of the control of Columbus Gold; cost increases; availability of qualified workers; competition for mining properties; risks associated with exploration projects, mineral reserve and resource estimates (including the risk of assumption and methodology errors); dependence on third parties for services; non-performance by contractual counterparties; title risks; and general business and economic conditions. Forward-looking statements are based on a number of assumptions that may prove to be incorrect, including without limitation assumptions about: general business and economic conditions; that Agnico-Eagle will decide to continue to earn into the Summit Project; that Agnico-Eagle will continue to have sufficient resources to earn into the Summit Project; the timing and receipt of required approvals; availability of financing; power prices; ability to procure equipment and supplies; and ongoing relations with employees, partners and joint venturers. The foregoing list is not exhaustive and we undertake no obligation to update any of the foregoing except as required by law.